When it comes to choosing the perfect Easter gift, the best ones are those that have a personalized touch. However, you may not have the time to spend to create these gifts yourself and your second best option is to buy gifts that you can personalize online and buy. There are many websites devoted to giving you personalized choices for gifts without the time and effort that it takes to make one. Below is a guide to personalized Easter gifts for kids that are available for purchase on the internet. You can go to any store and buy an Easter basket for your child. Choose to get your child one that will stand out among all the rest by choosing a personalized basket in that resembles an Easter bunny. This inexpensive gift can be used for years to come and will have your child the talk of the Easter party. 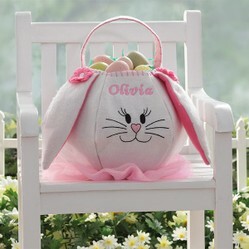 Hunting eggs will be a blast with a personalized Easter bunny basket that look just like a cute bunny. You can buy the one featured here for only $24.95 from Personalizationmall.com. For the little girl in your life, this is the perfect gift. This gift comes complete with a mommy bunny, a daddy bunny, and a baby bunny to represent a bunny family. It also has a miniature pink bed and chair for hours of play and enjoyment. The handle will allow her to carry with her all throughout the year and the embroidered name will ensure she never misplaces it. This is a special gift that is sure to create many Easter memories and become an heirloom. Check out this beautiful gift here. To go along with the homemade embroidered cotton tail cottage, choose the butterfly and coin purse set. This, too, is sure to be something that she carries with her everywhere she goes. Include a little cash in the coin purse to help begin a love of saving money. Buy the embroidered Butterfly Purse and Coin Purse set. Kids love to color. For Easter this year, give your kids a personalized crayon case with crayons and a spring or Easter themed coloring book. They can use this anytime of the year and will love to see their names on the case. It even makes the perfect gift to bring to school to help keep their crayons organized. Get this Personalized Crayon Case with Crayons for your kids from here. Make this Easter one that they will never forget, by giving them a letter from the Easter bunny. Your child will be thrilled to open the mail box and find a personalized letter and a colorful spring envelop directly from the Easter bunny. Buy this beautiful Personalized Letter from the Easter Bunny for only $9.95. Personalized Easter gifts for kids are a great choice to help celebrate the Easter season. Whether you are looking for a unique Easter basket or an embroidered purse set for your child, personalized gifts make the perfect way to celebrate the occasion. What personalized gifts will you choose to give the kids in your life this year? Oh my these Easter gifts for kids are all so adorable. My youngest daughter loves these sort of things, especially the carry all softies she can pack filled with her goodies. Great Easter Ideas!